McAuliffe scholars outperformed Framingham and the state in English Language Arts with 52% of McAuliffe scholars meeting or exceeding expectations compared with 37% of Framingham middle schoolers. McAuliffe scholars with disabilities subgroup outperformed the state and Framingham with 29% of McAuliffe scholars with disabilities meeting or exceeding compared with 7% of middle schoolers in Framingham. 7th: Determining the meaning of words in context; using evidence to analyze characters’ perspectives. 8th: Analyzing central idea of a text; determining the author’s point of view. A particular area for improvement is scholars’ skill at crafting a written response to a prompt guiding them to compare and analyze two texts about a similar topic. In addition, the humanities department will be working closely with Ms. Ciccone, our Technology Integration Specialist, to develop scholars’ skill at reading and interacting with texts on a chromebook and engaging in the writing process in the computer-based MCAS testing platform. McAuliffe scholars outperformed Framingham and the state in Mathematics with 50% of McAuliffe scholars meeting or exceeding expectations compared with 38% of Framingham middle schoolers. McAuliffe scholars with disabilities subgroup outperformed the state and Framingham with 26% of McAuliffe scholars with disabilities meeting or exceeding compared with 7% of middle schoolers in Framingham. 6th: Working with unit rates; completing real-world problems that involve fractions and percentages. 7th: Completing problems with rational numbers; solving problems that include tables and graphs. 8th: Working with reflected triangles; applying the Pythagorean theorem. An area for improvement is scholar’s ability to write about their mathematical problem solving and conceptual understanding. Writing about math is probably a least favorite thing to do for most scholars, but we have to guide our sixth, seventh, and eighth graders to develop this skill in order to showcase their thinking and understanding to the reader! This has already been named as the Math Department’s top priority for the 2017-18 school year. 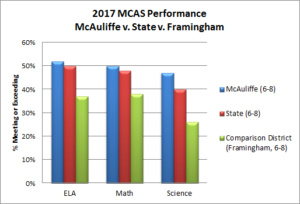 McAuliffe scholars outperformed Framingham and the state in Science, Technology & Engineering with 47% of our scholars scoring at advanced or proficient compared with 26% of Framingham eighth graders. McAuliffe scholars outperformed the state on many questions with strength in the areas of earth, space, and life sciences. Last year a team of teachers and leaders mapped out updates to our science scope and sequence so that our curriculum aligns with the new science standards. This year we are focusing on building and implementing new science expeditions and units that align with the updated science standards. We have many successes to celebrate and, as you can see, also have some areas for growth. As noted, we will continue to adjust our curriculum and instruction to ensure it is relevant, engaging, and appropriately challenging for all scholars. Within the next few weeks, families will receive their scholars’ individual MCAS reports. There are a few important things to know about the 2017 results. Most important is to recognize that the next generation MCAS is an entirely different test than previous tests your child has taken (MCAS, PARCC). We should not compare 2017 next gen MCAS scores with previous PARCC or MCAS scores; the new test is harder and the categories (exceeding expectations/meeting expectations/partially meeting expectations/not meeting expectations) do not correlate with the old MCAS categories (advanced/proficient/needs improvement/warning). Standard setting work done by a committee of public school teachers resulted in 50% of students meeting or exceeding expectations. For some scholars, there may appear to be a drop in scores (e.g. a scholar who previously scored “proficient” on the math assessment may now be scored as “partially meeting” or a scholar who previously scored “advanced” on the ELA assessment may now be scored as “meeting expectations”). The DESE is emphasizing that 2017 individual and school scores are baseline scores that will be used to compare our 2018 results with. Our aim at McAuliffe is to use the 2017 results to make improvements to our curriculum and instruction so that we ensure our scholars are mastering grade level content that will be assessed on the 2018 May tests. We are also using the results to identify specific scholars who may need targeted intervention; for example, we used the results to inform placements in literacy and math labs. ALL McAuliffe scholars will be taking the COMPUTER-BASED MCAS for English Language Arts and Mathematics in April & May 2018. Science will be paper-based for 8th grade. The computer-based platform will be new for most scholars so we will work together to prepare scholars for the platform. Last year our 8th graders used the platform and we piloted a sequence of training sessions that we will improve for this year’s use. Please mark the following weeks on your calendar for MCAS testing. Please do NOT schedule doctor / dentist appointments for these two weeks if at all possible! While standardized testing is only one of the ways we measure student learning at McAuliffe, it is an important measure that helps us assess our scholars’ mastery of skills and knowledge compared with scholars across the state. At McAuliffe, equally important are scholars’ development of Habits of Work and Learning and production of high quality work. We look forward to our scholars sharing these other dimensions of achievement with you during upcoming SLCs and culminating events. If you have questions about MCAS, please be in touch with me or Nellie Zupancic, our Director of Teaching and Learning, (nzupancic@mcauliffecharter.org). Thank you for your ongoing support that helps our scholars experience success!